The 2014 Fall/Winter season is getting a structural makeover. Structured menswear-inspired styles were seen all over the runways for the upcoming fall season, reworked for the feminine form, of course. Jil Sander showed a myriad of loose menswear slacks and oversized structured sweaters. She also showcased her new take on an oversized topcoat in a combination of grey, taupe and other neutral lightweight wool fabrics. 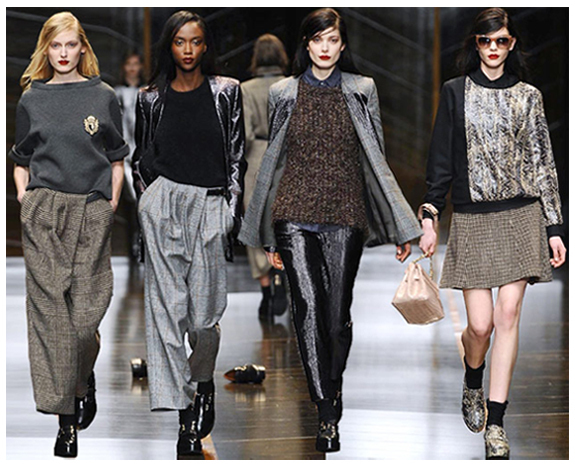 Trussardi’s Fall/Winter collection for 2014 was more overt in its boyish charms, with grey wool jumpsuits paired with menswear inspired loafers, as well as leather paneled boyfriend cardigans and cropped menswear style trousers in different suiting fabrics. Versace’s line for the season boasted masculine military details and suiting in dark teal and red velvets, with structured, close silhouettes. When accessorizing this season’s masculine inspired designs, keep the look bold and fresh, yet still feminine. Oversized cuff bracelets won’t be drowned out by the boxy silhouettes of menswear styles, but look for pieces like the copper rose bracelets from Shanghai Streets, Kate Spade’s scalloped enamel bangle, or Anndra Neen’s scaled cuff, which still have a touch of feminine flare. An oversized earring also makes a dramatic yet lady-like accompaniment to the masculine silhouettes of the season, such as the gold ribbon earrings from Kenzo or Aurelie Bidermann’s gold ginko drop earrings.